If you love watching the clouds, then you must also be interested in the variety of cloud forms such as the opacus clouds. What is an opacus cloud? How does it look like? How did they form and what type of weather condition does it bring? Get to know more about opacus clouds in the succeeding paragraphs. Read on. Opacus clouds refer to an extensive patch, layer or sheet of sufficiently thick clouds that completely cover the sunrays during daytime or the moonlight at night. Opacus is the Latin word for opaque which means “shady” which aptly describes the opacus cloud. This is a cloud variety found in different type of clouds. Opacus clouds appear in the main cloud genera such as stratus, nimbostratus, stratocumulus, altostratus and altocumulus. Opacus cloud appears as stratus cloud that forms a thick and dense layer of cloud like a huge blanket that prevents the sun from shining through. Nimbostratus Opacus appears as a thick and dark cloud layer that inhibits the sun from penetrating. This cloud is associated with gloomy and wet days. Stratocumulus opacus appears as a thick and irregularly-shaped cloud layer that resembles a huge blanket covering the whole sky without gaps or spaces. However, the sheets of clouds are partly uniform which make the cloud bases distinguishable. Rainfall is rarely generated from stratocumulus opacus. This cloud is characterized by a thick cloud layer covering the altostratus high above. Altostratus opacus cloud forms before a light-rain weather system thus making the sky gloomy. 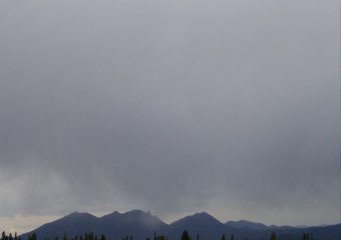 This opacus variation develops from solidifying altostratus translucidus and eventually becomes nimbostratus when rain begins to fall. This type appears like small fibrous clouds in the middle cloud level, and usually with a small portion forming a thick and dense layer of cloud that covers the altocumulus cloud. At What Height is Opacus Clouds Found? Since these clouds are associated with gloomy and wet days, they are found in low to middle altitudes. If they appear with low level clouds like stratus, stratocumulus and nimbostratus, opacus clouds can be found lower than 9,000 feet from the Earth’s surface and are largely made up of raindrops. If they appear with middle level clouds like altostratus and altocumulus, they can be found anywhere between 6,000 feet and 20,000 feet from the ground and are made up of ice crystals, snowflakes and raindrops. How do Opacus Clouds Form? Opacus clouds form due to the rising currents of air in the atmosphere. It occurs as the rising air is warmer than the surrounding air causing the atmosphere to become unstable. The rise of warm air can be due to surface heating from the sun or the development of low pressure. When the warm air condenses, it will form into clouds. How common are Opacus Clouds? Opacus cloud is common all over the world especially when a low pressure system is developing. When they appear in the sky, they indicate the presence of moisture in the atmosphere. Opacus clouds may be responsible for gloomy days when the sun or moon is completely covered by thick and opaque layers of clouds spreading across the sky.